Back in October, I reviewed Kat Von D's The Tattoo Chronicles (here). I also went to a book-signing and met Ms. Von D.
As you would expect, there was a long line to see the author, who is indisputably the most famous tattoo artist in the world. Despite the long line, I did have a chance to chat at length with several other people at the event. We talked tattoo as we queued along 46th Street, around the corner onto 5th Avenue, up an escalator, and through a maze of book stacks. One such fan was Melissa, a student, who was accompanied by several friends. Talking with Melissa and her friends made the two-hour wait much more bearable, indeed. 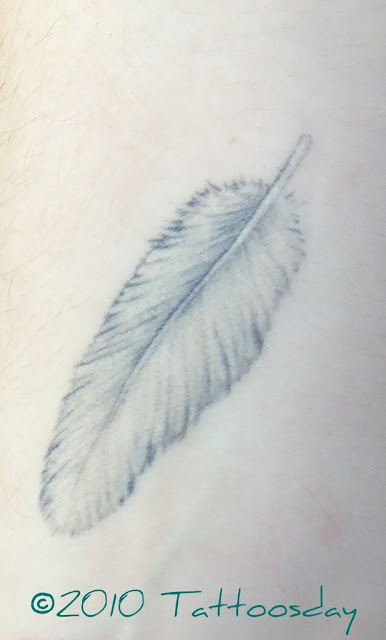 This white feather on the inside of her right wrist is tied to the memory of her mother who passed away a couple of years ago. 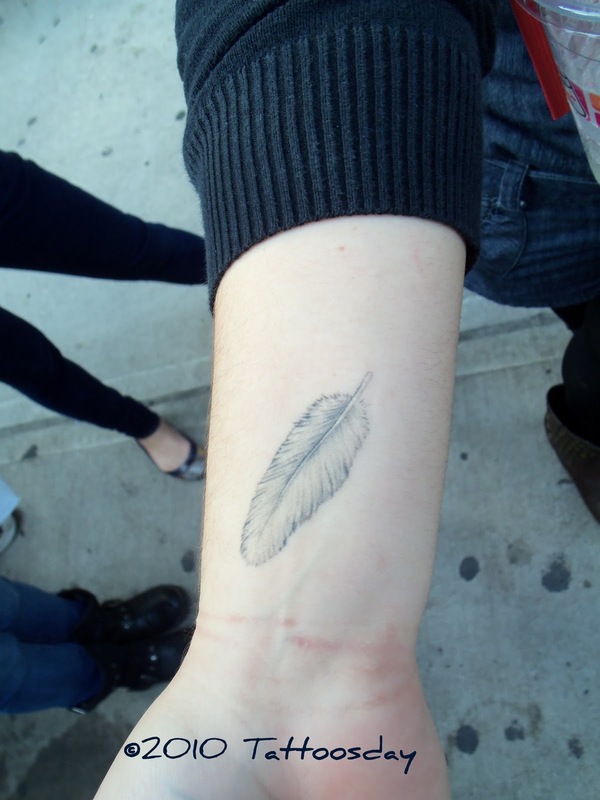 Melissa's aunt often said that a floating white feather represents the soul of someone who's died. That said, whenever Melissa sees one, she thinks of her mother. By tattooing it on her wrist, she is assured that the memory of her mom will always be close at hand. The tattoo was inked by Kerry O'Neill at Shotsie's Tattoo in Wayne, New Jersey. Work from Shotsie's has appeared previously here on the site. Thanks to Melissa (and her friends) for keeping me company on that long day in October, and a special thanks to Melissa for sharing this poignant tattoo with us here on Tattoosday!